Murphy is brindle and white with black trim and tips. He has what we call “Hoot Owl Eyes”, it look like he has eyebrows. He has a lot of reddish brindle on him, he is going to be a very handsome puppy. He is going to weigh about 10-11 lbs when full grown. He just loves puppy kindergarten and is always looking for his next puppy adventure. He is going to have very, very fluffy fur. He is very lovable and loves to cuddle and sit on your lap. He has a lot of unconditional love to give someone or some family. He is just waiting for you to pick him. He is AKC registered and has a great AKC Champion Bloodline. At SacRiver Puppies we “Pre-Spoil our Puppies for you!” At SacRiver Puppies we “Pre-Spoil our Puppies for you!” Full payment is expected one week prior to shipping. We accept MasterCard, Visa and Discover over the phone. If you decide to have your puppy shipped, we use a pet nanny service for transporting our pets. She will personally fly in the cabin with your puppy. The cost is $400. The shipping price includes transportation to the airport, payment for the pet nanny service and puppy microchip etc. Depending on what airport the puppy and pet nanny is flying into, you would meet our pet nanny at the American baggage service area. We will be able to give you all of these details when we arrange for the puppy’s delivery to you. Contact us by email at contact@sacriverkennel.com, by phone 479-806-5061 or fill out the form below. Please be prepared to provide a personal reference and a vet reference. Please be sure you are ready for a puppy before you make your inquiry. This is a serious commitment. 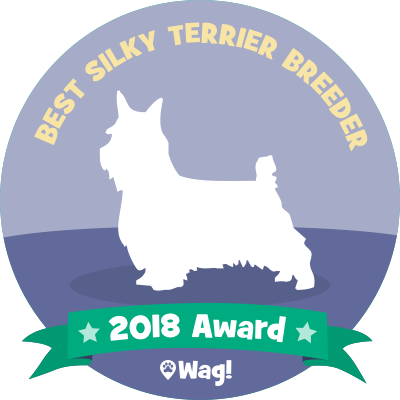 SacRiver Kennels based in Ash Grove, MO is a Top 2018 Silky Terrier Breeder!